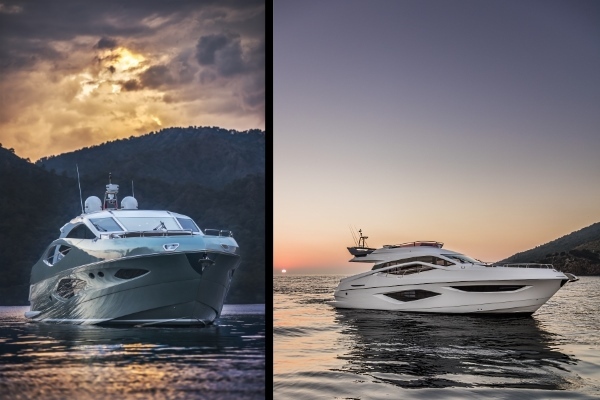 Europe’s largest boat show, the Yachting Festival at Cannes, is set to see a double debut from Numarine. The Yachting Festival at Cannes is set to begin on 6th September, 2016. Numarine, a renowned producer of high performance motor yachts, will be launching two new models – the 78HT Evolution and the 60 Flybridge – at the boat show. The innovative 78HT from Numarine is an exhilarating invention in a never seen before “facelift” evolution of the highly popular 78 Hardtop and 78 Flybridge models. The designers have added some unique and subtle design upgrades to the original hull, giving it a refreshingly innovative look whilst maintaining the signature design of the previous 78 models. The huge saloon is accentuated with a lot of natural light and the contemporary furniture makes a definitive and unique entertainment space for socialising. The owner’s cabin features extra wardrobe space, a walk-in shower, separate head and twin basins in a full width cabin with a one of a kind design. Also featured are three spacious guest cabins accentuated with the best amenities and fixtures. 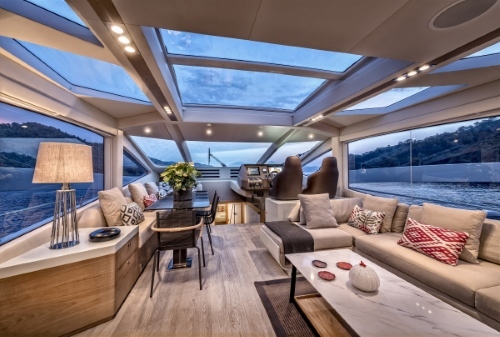 On the outside, the focus has certainly been placed on providing maximum relaxation space for the guests with an inventive sun-pad arrangement and a forward-facing lounge seat that offers unparalleled views. The 78HT Evolution hides an all-new “Silent Package” that features an intelligent multi-levels air conditioning system, a smart energy management system and a system that uses lithium-ion batteries which makes it possible for the owner to sit at anchor for an entire day and enjoy the serene atmosphere in complete peace. The generator requires a short charge in the evening to ensure that the guests get to sleep in cool cabins completely at peace. This unique invention along with the efforts by Numarine Engineering to reduce all sorts of noise, vibration and harshness has resulted in a design that has set a new level for comfort onboard, while navigating or when anchored. The 78Ht Evolution is claimed to be the quietest yacht built till date. 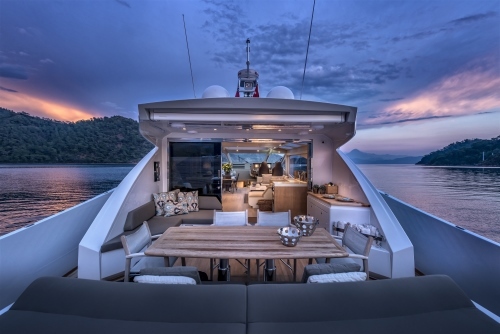 Featuring a 5.15 meter beam and measuring 18.4 meters LOA, the Numarine Flybridge 60 exhibits the same daring design aesthetics featured in the Turkish yard’s family line of products. Abundant open areas, brightly lit interiors and a sporty design make the most of the generous onboard space available on the yacht. 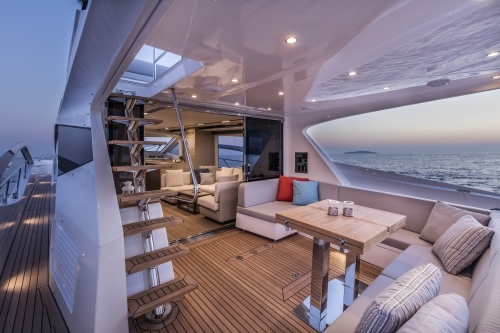 The focus on light-weight materials and a unique vacuum infusion composite construction makes the FLybridge 80 one of the most competitive yachts available. It features a 28 knot cruising speed, which utilizes less powerful engines and an efficient IPS drive system that keeps fuel consumption and maintenance costs in check. The yacht can reach a top speed of 35 knots giving it a competitive edge over all other models. Designed for comfort and relaxation, the three guest cabins feature private bathrooms and the full beam owner’s suite features huge windows at water level that provides breathtaking views of the underwater. The Cannes Yachting Festival will end on 11th September, 2016. Find more details on the show by clicking here. Tagged Big Boys' Toys, LifeSpice, Luxurious lifestyles, Luxury Travel, yachts. Bookmark the permalink.